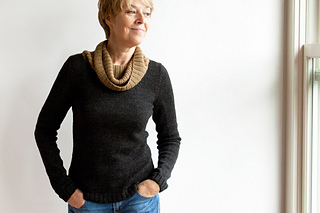 Introducing Estelle’s Envy (whose name has been taken from a character in Lillian Hildegarde’s novel) is a slim pullover with alpaca collar abundance. The simply shaped bodice sets stage for the drama of its draping cowl. Bodice and sleeves are worked in simple stockinette with rib trimming using sport weight wool. The bodice extends mid-hip in length with gentle shaping at the waist. It’s worked bottom-up in the round to the armholes, then split and worked flat. Long trimmed sleeves are worked bottom-up in the round and set-in. 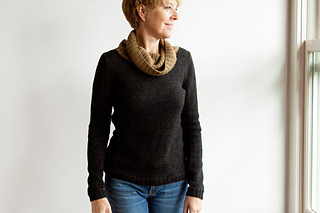 Luxurious collar is worked in same rib using alpaca dk – that is immensely soft around the neck. • Cascade 220 Sport by Cascade Yarns (100% Peruvian Highland wool; 164 yds per 50g skein); color – Jet #4002 (bodice and sleeves); 6, 7, 8, 8, 9, 10, 10 skeins, or for comparable yarn, approximately 950, 1060, 1165, 1275, 1410, 1540, 1650 yards. • Baby Alpaca DK by Shibui Knits (100% baby alpaca; 255 yds (233m) per 100g skein); color – Camel #2005 (collar); 1 skein, or for comparable yarn, approximately 205, 225, 235, 255, 255, 255, 255 yards. Note that for sizes 1x to 3x, the collar length diminishes to 11, 11, 11, 11, 10.5, 10, 9.5 inches, to stay within the not required but more economical 1 skein yardage limit. To work 11 inches for all sizes, yarn quantity as follows – 1, 1, 1, 1, 2, 2, 2 skeins or 205, 225, 235, 255, 265, 280, 290 yards. Knit, purl, long-tail CO, circular knitting, ssk, k2tog, p2tog tbl, stitch pick up around neckline, short row shaping and 3 needle BO (at shoulders), blocking, and seaming (sleeve cap into armholes). 8 page pdf includes pattern instructions, photographs, schematics, and definitions for relevant abbreviations.